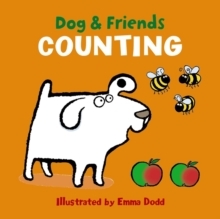 Follow the animal chums and learn to count along the way. There's Dog, of course, rolling on his back in the hope of getting his tummy tickled - he's one of a kind! With him in the field are a couple of frogs, on their way to hopping over a hill. Alongside them are a trio of cows, mooing noisily. In fact, they're making such a racket that a flock of four birds decide to fly away to somewhere quieter. The pages get more and more crowded as five ducks, six sheep and seven pigs enter the scene - can you count them all in each picture? It's a good thing that eight apples and nine bees are quite small, or we might not have been able to fit them all in! With appealing images to look at and talk about, this book is a wonderful aid to learning that little ones will want to return to again and again. It is built to last, with sturdy board pages that will stand up to repeated use.